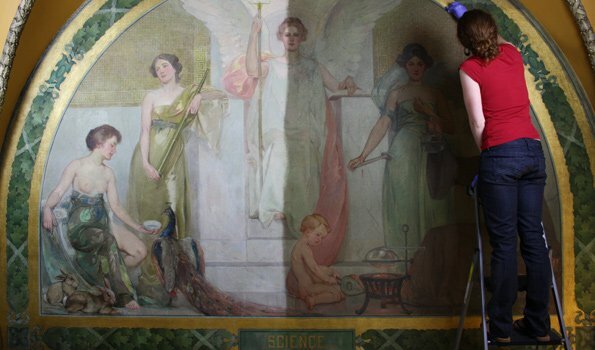 Mural conservation is one of the major strengths of the laboratory. Parma’s large space and high ceilings, large vacuum tables, and custom-built support structures can accommodate artworks of extreme dimensions at the laboratory. Most of Parma’s mural conservation work, however, takes place on-site. Working from coast-to-coast, we have conserved hundreds of murals in museums, post offices, court houses, public schools, churches, libraries, and private residences. A mobile conservation laboratory can be set up at almost any site where our services are needed. Between 1934 and 1943 the Treasury Section of Fine Art (TS) was established to commission artwork in newly-constructed Federal Post Offices and Courthouses. Unlike other New Deal programs, (such as the WPA) the Treasury Section was not a relief program. Instead, mural contracts were awarded based on national and regional art competitions. Only the best artists were selected for these mural projects. To date, Parma has conserved more than two hundred post office murals nationwide. Church mural conservation is offered by Parma as an on-location service. Years of candle soot and grime deposits can obscure the intended luminosity of all painted artwork and murals inside a church. Even fire and smoke damage can be reversed if carried out properly. 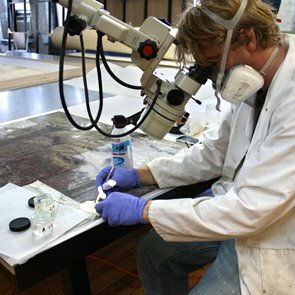 This work should only be done by professional conservators, to carefully clean and preserve the artwork. In no case should the original artwork be repainted. If your church is about to undergo renovation or painting, please call our laboratory for consultation. The Blackstone Memorial Library houses one of the jewels of Chicago’s artistic past; a small cupola of beautiful gilt moldings and magnificent murals painted by the celebrated artist, Oliver Dennett Grover. Placed in the cupola lunettes, these paintings feature the themes of art, literature, science, and labor.